MADISON, WI (March 2, 2018) — “Instead of burnout, I hope that women will have the ability to burn bright,” said Kristen Soltis Anderson, keynote speaker and co-founder of Echelon Insights and author of The Selfie Vote. “Young women are interested in being a good parent, professional and partner. 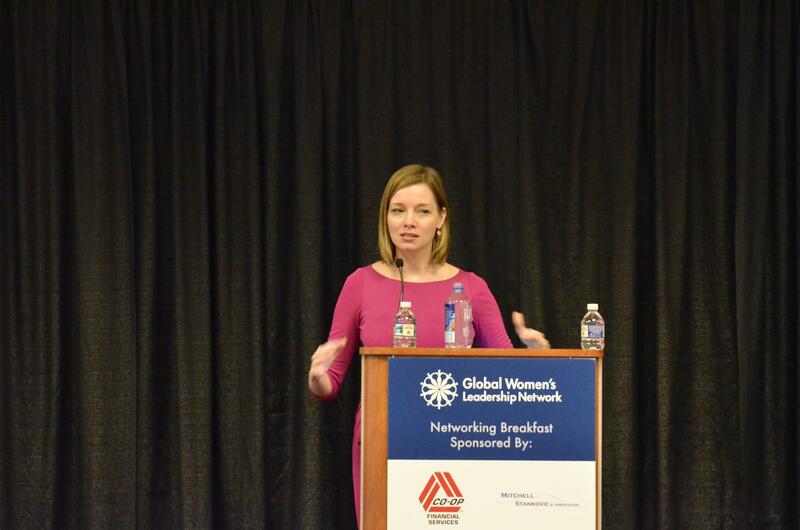 So, the belief that I can be anything has turned into I can be everything,” said Anderson, speaking to 200 attendees at the World Council’s Global Women’s Leadership Network breakfast on February 28 at the Walter E. Washington Convention Center. Anderson highlighted data and trends driving female consumers and how credit unions can leverage this data to maintain their competitive advantage. “Today we are asking women who are already leaders in so many areas of their professional and personal lives to save the world, too. Help people make that conversion in your organizations and behave in a way that meets the expectations women have for you, empower them, do not have a one size fits all answer for things and act in a way that is ethical and respectful,” said Anderson. She stressed it is key for the credit union movement to understand the pressures for women in this arena and to find ways to better equip and prepare women to meet the expectations that they and others have placed upon them. 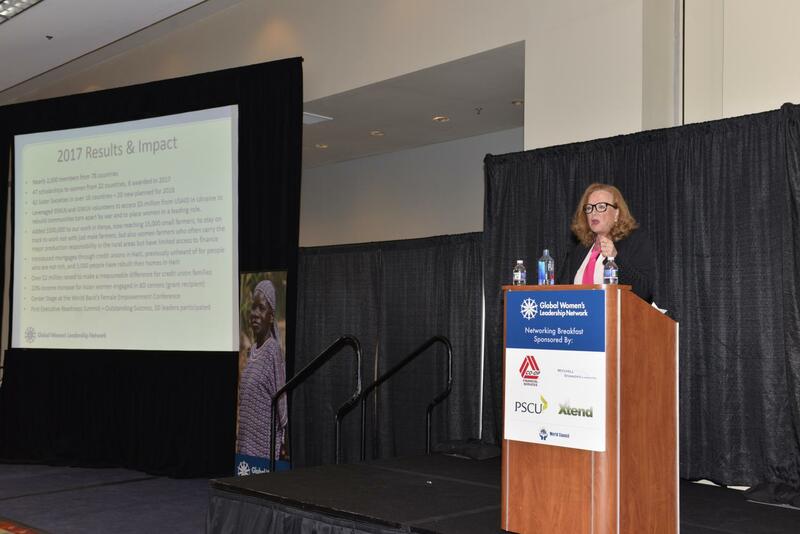 Susan Mitchell, Chair of the Network and CEO of Mitchell, Stankovic and Associates and recipient of the 2018 Herb Wegner Memorial Award for Outstanding Individual Achievement encouraged credit union leaders to engage men in the movement and raise visibility, focus on diversity, work within their credit unions to mentor and develop talent and get involved with World Council international development programs. “This is not a women’s issue. It is a human issue and we must think globally and act locally,” said Mitchell. “Globally, women control 65 percent of consumer discretionary spending, yet women’s complaints about financial services range from a lack of respect to blanket solutions that leave them behind. Without more women in leadership, credit unions struggle to understand and win over this crucial customer demographic. We believe diversity and inclusion is the driver of innovation,” said Calyn Ostrowski, Executive Director, Global Women’s Leadership Network. 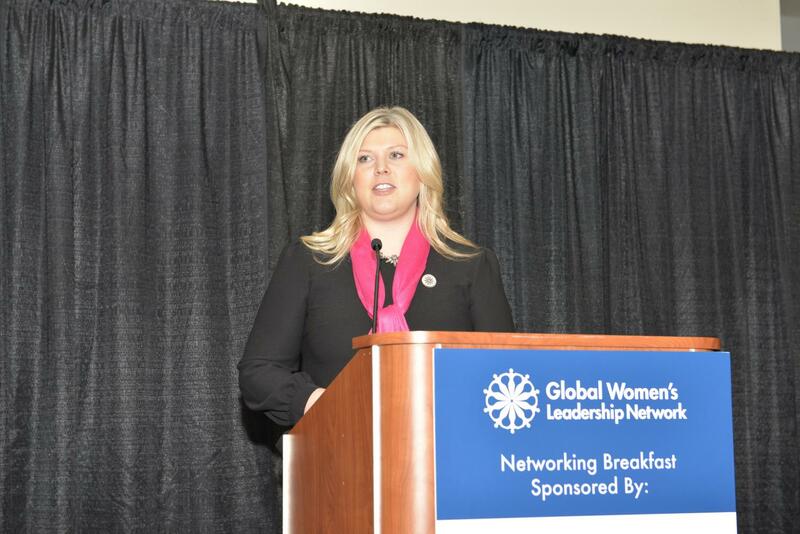 Liz Winninger, CEO of Xtend, Inc was awarded the 2017 Global Women Emerging Leader award, recognizing young women active within the field, making a significant impact on the industry and advancing the values of our mission. Winninger attributed her involvement in advancing the Michigan Sister Society as a direct result of her fellow Global Women sisters and encouraged participants to be a global sibling. The networking breakfast was sponsored by CO-OP Financial Services; Mitchell, Stankovic & Associates; PSCU and Xtend. Global Women is a World Council program that was established in 2009 to address and facilitate the industry’s gender gap while also leveraging resources to strengthen the economic security of women and their families. The suite of programming provides credit union women with tangible skills, tools and resources they need to lead and offers actionable steps for organizations to follow. It is open to all women and includes the critical support, engagement, and participation of male champions.